French sculpture has been an original and influential component of world art since the Middle Ages. The first known French sculptures date to the Upper Paleolithic age. French sculpture originally copied ancient Roman models, then found its own original form in the decoration of Gothic architecture. French sculptors produced important works of Baroque sculpture for the decoration of the Palace of Versailles. In the 19th century, the sculptors Auguste Rodin and Edgar Degas created a more personal and non-realistic style, which led the way to modernism in the 2Oth century, and the sculpture of Pablo Picasso, Georges Braque, Marcel Duchamp and Jean Arp. Two of the largest prehistoric sculptures can be found at the Tuc d'Audobert caves in France, where around 12–17,000 years ago a sculptor used a spatula-like stone tool and fingers to model a pair of large bison in clay against a limestone rock. Human forms and animals were common in the early sculpture, often in the form of bas-relief. Figures expressed emotion, and were often distorted; the forms of women were often strangely obese. The Venus of Laussel is one of he earliest examples. With the beginning of the Mesolithic the amount of figurative sculpture diminished, and animals predominated, expressing mobility and vigor. In the later Mesolithic period, the sculpture became less realistic and turned toward abstract, ornamental deocrative forms, which continued through the Bronze Age and the Iron Age. The arrival of the Celts, Ligures and Iberian peoples did not radically change the style. Human forms were usually carves simply as stylized silhouettes. On the coast of the Mediterranean, sculptors made friezes of warriors and various deities seated with their legs crossed. Under the Capetian dynasty, the Kingdom of France was gradually returned to calm, stability and prosperity. 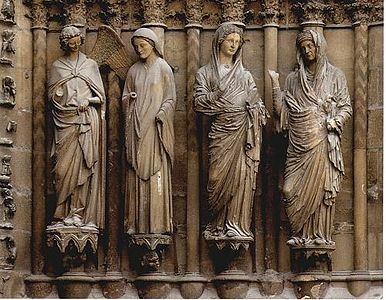 A reform of the church and the founding of new religious orders led to important commands for sculptures, especially for the new Cluny Abbey (1088–1108) of the Benedictine order. Other Abbeys across France imitated its use of sculptural decoriation. In the later Romanesque period, sculpture was often used to at the most important points, such as the facades, to emphasize the lines of the structure. It often used geometric designs (circles, squares, triangles). Spaces were crowded with figures, which were often contorted so they seemed to be dancing. The sculpture was most profuse on the capitals of columns and on the portals, where it was used to present very complex and extended biblical stories. Sculptors also depicted a large number of animals, both real and imaginary, including chimeras, sirens, lions, and a wide range of monsters. Imagination usually prevailed over realism. The southwest of France, around Toulouse, had a particular style, more vivid and active than the north. A remarkable group of Romanesque sculpture is found in the decoration of the Basilica of Saint-Sernin, Toulouse in Toulouse, dating to the late 11th and early 12th century. The figures are much more realistic, and make skillful use of shadows and light to bring out the details. One of the most distinctive works is the altar table, signed by its sculptor, Bernardus Geldvinus. He also made the seven sculptural reliefs found in the ambulatory of the cathedral. Sculpted face from Saint-Philibert de Tournus Abbey in Burgundy. Germain Pilon (1535–1590) was another major figure. He was a pupil of Bontemps, a fierce proponent of the Catholic side in the Wars of Religion and Counter-Reform. He was also an excellent portraitist and student of anatomy and detail. His major works included a monument for the heart of Henry II of France, based on a drawing of Francesco Primaticcio, the tombs of Henry II of France and Catherine de Medicis, and a variety of other religious works. The major sculptors who decorated the gardens included François Girardon (1628-1715), Antoine Coysevox (1640-1720) and Jean-Baptiste Tuby (1635-1700). Coyseyvox, besides making fountains, produced very fine portrait busts of the King and his chief ministers. He also created sculptures portraying members of the Court or nobility in mythological costume, such as Duchesse of Burgundy represented as the Goddess of the hunt, Diane. Nearly all the major sculptors of the period, including Coysevox, Girardon, Jean-Louis Lemoyne (1665-1755), and Edmé Bouchardon (1698-1762) also made monumental equestrian statues of the King for royal squares in the large cities, including Place Vendôme and Place des Victoires in Paris. In the later years of the reign of Louis XIV, wars drained the treasury and large sculptural commissions became scarce. The King turned his attention to the decoration of his Château de Marly, built as a quieter retreat from Versailles. Statues there included works by Coysevox and his students, including Nicolas Coustou and, shortly after his reign, a famous pair of horses by Guillaume Coustou (1739-45), whose replicas now decorate the beginning of the Champs-Elysees. The reign of Louis XV and the patronage of Madame de Pompadour brought a turn toward neoclassicism. Major royal commissions usually went to the two established official royal sculptors, Jean-Louis Lemoyne (1665-1755(, and his son, Jean-Baptiste Lemoyne, who was one of the finest portraitists of the period, and to Augustin Pajou, but madame Pompadour gave commissions to a new generation of sculptors, including Étienne Maurice Falconet and Jacques Caffieri. Falconet achieved international renown; he was invited by the Russian Empress, Catherine the Great, to make a monumental statue of Peter the Great on horseback, known as The Bronze Horseman, and to Prussia to make statuary for the gardens of Frederick the Great at Sanssouci Park in Potsdam. The sculptor Honoré Daumier (1808-1879) occupied a unique place in 19th century sculpture, with a series of sculptures of portraits of members of the French Parliament that mercilessly caricatured and satirized them. Jules Dalou (1838-1902) a pupil of Carpeaux, followed him as an important monumental sculptor, Triumph of the Republic, (1889) marking the centenary of the French Revolution, in the Place de la Nation. The most famous French sculptor of the 19th century, Auguste Rodin (1840-1917), wished to be a pupil of Carpeaux, but did not succeed, though he later borrowed one of Carpeaux's subjects, Ugolin, the Thinker. He did become a student of Barye, who was his drawing instructor. His extraordinary abilities of careful observation combined with an ability use light, and to express emotions, very quickly made him famous, though it also quickly brought him criticism. all his major public works were attacked. His most famous works included The Thinker, the The Burghers of Calais, and Balzac. By the time of the 1900 Paris Exposition, he had so many commands that he served principally as a modeler, employing a large studio of assistants to actually make the statues. He conceived his famous statue, The Thinker, in 1881-1882, and displayed a full-size model in 1904 at the Salon des Beaux-Arts. Twenty-eight castings of the statue were eventually made. Toward the end of his life, he made an even more influential work, a sculptural portrait of Honoré de Balzac. Rodin was selected for the commission by the writer Emile Zola Rodin experimented with many different versions costumes and poses, beginning in 1891, and finally decided to portray not the physical appearance, but the sprit and thoughts of Balzac, through an exaggeration of his features. The work caused a scandal when it was presented in 1898, and it was rejected by the Salon of the National Society of Fine Arts. A subscription covered the cost of the model, which was put up on Avenue Friedland in 1902. Rodin never saw the final bronze version, which was placed at the intersection of Avenues Raspail and Montparnasse in 1939. The students of Rodin modified and created new variations, many expressing the sense of movement, speed and change felt at the end of the century. These sculptors included Rodin's student and lover Camille Claudel (1864-1943). François Pompon, who had worked in the studio of Rodin, inherited the role of animal sculptor that Bayre had occupied, though unlike Bayrle he had no interest in realism. He simplified and purified the forms, seeking just the essence of the animal. The use of new and unusual materials was a common feature in much 20th century sculpture. Henri-Georges Adam made very large abstract works of concrete, such as his 22-meter long Signal at the Museum of Fine Arts in Le Havre. The most celebrated and controversial work in the 20th century was probably Fountaina work entered into the 1917 Exhibition of Independent Artists in New York by French artist Marcel Duchamp. It was an ordinary urinal purchased by DuChamp, and proposed by DuChamp as a work of art. It was reluctantly accepted by the show organizers, since any sculptor who paid the fee could show his work, but it was never put on display, and created an enormous scandal in the art world, as Duchamp intended. Gaston Lachaise also seemed to mock the traditions of classical sculpture, by his inflated nudes. César Baldaccini (1921-1998) was a notable figure of French sculpture in the second half of the 20th century. César was at the forefront of the Nouveau Réalisme movement with his radical compressions (compacted automobiles, discarded metal, or rubbish), expansions (polyurethane foam sculptures), and fantastic representations of animals and insects. ^ a b c Toman 2015, pp. 258-263. ^ Jeancolas 1992, p. 3-4. ^ Ducher 1993, p. 42. Brocvielle, Vincent (2017). La Petit Larousse de l'Histoire de l'Art (in French). Larousse. ISBN 978-2-03-5936-39-4. Jeancolas, Claude (1992). Sculpture Française. Paris: CELIV. ISBN 2-86535-162-9. Ducher, Robert (1998). Caractéristique des Styles (in French). Flammarion. ISBN 2-08-011539-1. Erland-Brandenburg, Alain (2005). L'art roman- Un défi européen (in French). Gallimard. ISBN 2-07-030068-4. Mignon, Olivier (2017). Architecture du Patrimoine Française – Abbayes, Églises, Cathédrales et Châteaux (in French). Éditions Ouest-France. ISBN 978-27373-7611-5. Toman, Rolf (2015). L'Art Roman – Architecture, Sculpture, Peinture (in French). H.F. Ullmann. ISBN 978-3-8331-1039-9. 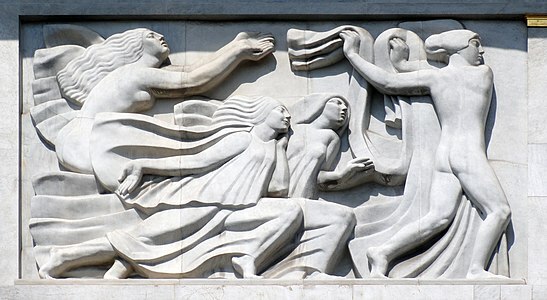 Alicia Penalba (August 9, 1918 – November 4, 1982) was an Argentine sculptor, tapestry designer, and weaver. Anne Pingeot (born 13 May 1943 in Clermont-Ferrand, Puy-de-Dôme) is a French art historian specialising in French sculpture of the 19th century and author of several books and catalogues. She was curator at the department of sculpture at the Louvre and the Musée d'Orsay. She was the mistress of François Mitterrand, the former President of the French Republic. Together they had a daughter, Mazarine Pingeot. Charles Louis Eugène Virion (Ajaccio, 1 December 1865 - Montigny-sur-Loing, 30 December 1946) was a noted French sculptor and ceramicist, principally of animals.Virion studied sculpture in Paris under Jean-Paul Aubé and Charles Gauthier and exhibited at the Salon des Artistes Français from 1886 until the 1930s. He was awarded a distinction in 1893 and became a member the same year. He won a third-class medal in 1895. At the Paris Exposition Universelle of 1900 he won a bronze medal. He also exhibited at the Salon des Animaliers after 1913.After the First World War, he made memorials for several municipalities including those of Montigny-sur-Loing, Nemours, La Genevraye and Arbonne-la-Forêt. The Doorway from Moutiers-Saint-Jean is a portal dating from c 1250, originally for the monastery of Moutiers-Saint-Jean, near Dijon, Burgundy, France, and installed at The Cloisters, New York City, since 1932. It was designed in the Gothic style and carved from white oolitic limestone. The abbey was founded in the 5th century, and became a major center of influence. The abbey was patronised by a line of kings and nobles over the centuries; at one the time it was financed by the dukes of Burgundy.Moutiers-Saint-Jean was sacked, burned and rebuilt a number of times; in 1567 the Huguenot army struck off the heads of the two kings. In 1797, after the French Revolution, the entire building was sold as rubble for rebuilding. It lay in ruin for decades, with the sculpture severely defaced, before the door's transfer to New York, where it is now situated between the Romanesque Hall and the Langon Chapel. The doorway, the main portal of the abbey, was probably built as the south transept door, facing the cloister. It can be linked stylistically to a number of other similar contemporary works in France. The sculptured forms of the donors, flanking either side of the doorway, probably represent the early Frankish kings Clovis I (d. 511), who converted to Christianity c 496, and his son Chlothar I (d. 561). The piers are lined with elaborate and highly detailed rows of statuettes which are mostly set in niches, and are badly damaged; most have been decapitated. The doorway has been described as "without doubt the finest Gothic portal in America", while the Cloisters considers it amongst their most prized objects, due mainly to the richness and delicacy of its style and the care shown to its overall composition. Françoise-Joseph Duret (12 November 1729 – 7 August 1816) was a French sculptor. He was the father and teacher of Francisque Joseph Duret. Born at Valenciennes, the son of Charles Durez, of Spanish origin, Duret was prince of the Academy of St. Luke, a member of the Académie royale de peinture et de sculpture, and sculptor and decorator for Honoré Armand de Villars. His reception piece at the Academy, representing Diogenes looking for a man, is at the Museum of Fine Arts of Valenciennes. He married the daughter of his brother Jean-François Last. Joseph Duret had had several children all of whom died, before his son Francisque Joseph Duret survived, and became a renowned artist in his own right. The brothers Gaspard (born 1624 or 1625, died 10 December 1681) and Balthazar Marsy (baptised 6 January 1628, died May 1674) were French sculptors. Originally from Cambrai, they moved to Paris and were employed by King Louis XIV, particularly for the decoration of the palace and gardens at Versailles. Their sister Jeanne was married to the sculptor Pierre Le Gros the Elder and was the mother of the sculptor Pierre Le Gros the Younger. Jacques François Joseph Saly, also known as Jacques Saly (20 June 1717 – 4 May 1776), French-born sculptor who worked in France, Italy and Malta. He is commonly associated with his time in Denmark he served as Director of the Royal Danish Academy of Art (1754-71). His most noteworthy work is the equestrian statue Frederik V on Horseback at Amalienborg. Jean-Baptiste Lemoyne (15 February 1704 – 1778) was a French sculptor of the 18th century who worked in both the rococo and neoclassical style. He made monumental statuary for the Gardens of Versailles but was best known for his expressive portrait busts. Jean-Baptiste Pigalle (26 January 1714 – 20 August 1785) was a French sculptor. Jean Goujon (c. 1510 – c. 1565) was a French Renaissance sculptor and architect. Nicolas Schöffer (Hungarian: Schöffer Miklós; 6 September 1912 — 8 January 1992) was a Hungarian-born French cybernetic artist. Schöffer was born in Kalocsa, Hungary and resided in Paris from 1936 until his death in Montmartre in 1992. He built his artworks on cybernetic theories of feedback interactivity primarily based on the ideas of Norbert Wiener. Wiener's work suggested to Schöffer an artistic process in terms of the circular causality of feedback loops. Schöffer's kinetic art sculpture "CYSP 1" from 1956, that made use of electronic computations developed by the Philips Company, is considered the first cybernetic sculpture in art history. The sculpture is set on a base mounted on four rollers, which contains the mechanism and the electronic brain. The plates are operated by small motors located under their axis. Photo-electric cells and a microphone built into the sculpture catch all the variations in the fields of color, light intensity and sound intensity. All these changes occasion reactions on the part of the responsive sculpture. Philippe Danfrie the elder (about 1532 in Cornouaille in Brittany - 1606 in Paris), was a designer and maker of mathematical instruments in metal and paper, as well as a type-cutter, engraver, minter of coins and medals, publisher and author. Much is known about Danfrie's life and activities. He is probably best known as designer of the surveying instrument known as the graphometer. Danfrie went to Paris in the 1550s and set up as an engraver of letter punches. He produced a number of books in partnership with Richard Breton in 1558–60 and later with Pierre Haman and Jean Le Royer. He also made mathematical instruments, globes and astrolabes and dies for marking bookbindings. In 1571 he cut his first dies for jetons. As Engraver-General of the French coinage from 1582, he provided the puncheons from which the dies used in every mint in France were taken. He also produced a number of medals (e.g. London, British Museum) commemorating the events of the first fifteen years of Henry IV’s reign. Engraver and superintendent of the Paris Mint, Philippe Danfrie was also an engineer and inventor of scientific instruments. Active in the second half of the sixteenth century, he built globes, astrolabes, and clocks. He invented a typeface that he used in his published writings. These include: Declaration de l'usage du Graphometre..., printed in Paris in 1597 together with Traicte de l'usage du Trigometre, avec le quel on peut facilement mesurer sans subiection d'Arithmetique. His son Philippe Danfrie the younger (b. ?Paris, c. 1572; d. Paris, 1604) was appointed Controller-General of effigies in 1591. On his appointment it was claimed that he had demonstrated great skill in modelling portraits in wax and engraving puncheons. His most famous and only signed medal (e.g. London, BM) is cast rather than struck and celebrates the victory of Henry IV over the Duke of Savoy in 1600. Pierre Le Gros the Elder (1629 – 11 May 1714) was a French sculptor whose output was largely absorbed by the decoration of the château and the gardens of Versailles, often working to designs provided by Charles Le Brun (like for L'Eau (the Water)) and collaborating with other sculptors of the Bâtiments du Roi. His son, Pierre Le Gros the Younger worked almost entirely in Rome. The elder Le Gros was born at Chartres and was a pupil of Jacques Sarrazin. He was received into the Académie in 1666 and completed many commissions for Versailles including statues in bronze and marble, bas reliefs and fountains. At Versailles, his bronze fountain sculpture of a cupid, "the Genius of Royal Power" seated on an eagle that ejected a spout of water, was engraved by Jean le Pautre (his father-in-law) in the 1670s as part of the series of images that helped disseminate the Baroque Classicism of Versailles throughout Europe. 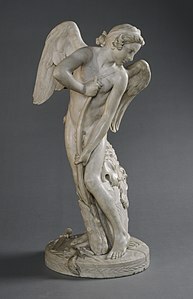 Another fountain sculpture for Versailles, Cherubs Playing with a Lyre, of 1672-1673, was removed from Versailles in the mid-eighteenth century and is now in the National Gallery of Art, Washington DC.Projects for the Bâtiments du Roi were distinctly a coordinated cooperative affair. A case in point is the Porte Saint-Martin in Paris, designed by Pierre Bullet and carried out between 1672 and 1674. The team of sculptors providing bas-reliefs for the spandrels of the monumental rusticated triumphal arch were Gaspard Marsy, Pierre Legros, Etienne Le Hongre and Martin Desjardins and their assistants. Le Gros' contribution was The Capture of Limburg, 1675, but the subject, a seated woman by a supine lion, was dictated to Le Gros, and the general composition as well. His first wife, Jeanne (married 1663, died 1668), was the sister of the sculptors Gaspard and Balthazard Marsy, his second wife, Marie (married 1669), was the daughter of the engraver Jean le Pautre.He died in Paris. Pierre Le Gros (12 April 1666 – 3 May 1719) was a French sculptor, active almost exclusively in Baroque Rome. Nowadays, his name is commonly written Legros, while he himself always signed as Le Gros; he is frequently referred to either as 'the Younger' or 'Pierre II' to distinguish him from his father, Pierre Le Gros the Elder, who was also a sculptor. The "ardent drama" of his work and its Italian location make him more an Italian, than a French, sculptor. Despite being virtually unknown to the general public today, he was the pre-eminent sculptor in Rome for nearly two decades, until he was finally superseded at the end of his life by the more classicizing Camillo Rusconi. Pierre Lepautre (4 March 1659 – 22 January 1744) was a French sculptor, a member of a prolific family of artists in many media, who were active in the 17th and 18th centuries. He was born and died in Paris. He won the Prix de Rome, for study at the French Academy in Rome, where he was a pensionnaire' from 1683 to 1701. While in Rome he sent back to France a number of sculptures demonstrating his skill, among which were the Faune au chevreau of 1685, which went to ornament the gardens at Château de Marly. Lepautre returned to Paris in 1701. His Atalante (1704) was also destined for Marly. From 1705 to 1710, he was occupied with decorative bas-reliefs and sculptures for the royal chapel of Versailles, under the artistic supervision of Jules Hardouin-Mansart: his are the colossal statues of Saint Ambrose and Saint Gregory.A retable in the form of a monumental gateway in the église de Saint-Eustache, Paris, illustrates the assumption of Saint Agnes. His completion of the over-lifesize group of Arria et Pœtus (finished 1695) after the design begun by Jean-Baptiste Théodon proceeded too slowly and Énée portant son père Anchise suivi d'Ascagne (signed and dated 1716), after François Girardon demonstrated his facility and fidelity as an executant. The sculpture of Aeneas carrying Anchises was begun in Rome, where Lepautre made numerous terracotta bozzetti for it. The sculpture gained renown for Lepautre: bronze reductions of it were made for collectors. The 19th-century classicizing sculptor David d'Angers had one of Lepautre's designs for it, which was given by his widow to the museum in his native city.Pierre Lepautre preferred to become a member of the modest artists' Académie de Saint-Luc, for which he held a lifetime post as Rector, rather than try for the more prestigious Académie royale de peinture et de sculpture. The Rudier Foundry (Fonderie Rudier) was a foundry run by Alexis Rudier (died 1897) and his son Eugène Rudier (1875-1952). It worked with some of the most notable sculptors of the 19th and 20th centuries, including Auguste Rodin, Antoine Bourdelle, Gustave Miklos, Aristide Maillol and Daumier. Their casts were signed "Alexis RUDIER Fondeur PARIS". The tomb of Francis II, Duke of Brittany is a monument located in Nantes, in the Cathedral of St. Peter. The project was commissioned by Anne of Brittany, Queen of France, who was the daughter of Francis and his second wife Margaret of Foix, who is also depicted beside Francis. The tomb was originally located in the chapel of the Carmelites in Nantes. Francis II had wished that his body rest there, to join the remains of his first wife Margaret of Brittany. The tomb eventually received the body of Francis and both his wives, though only his second wife (Anne's mother) is depicted. It was executed in Carrara marble in the early sixteenth century by the sculptor Michel Colombe based on a design by the royal artist Jean Perréal. It is the first major work of art in the Renaissance style in Brittany and is considered a masterpiece of French sculpture. Émile Gilioli (b. Paris, 10 June 1911, d. Paris, 19 January 1977), was a French sculptor. Gilioli was one of the representatives of abstract French sculpture in the 1950s.